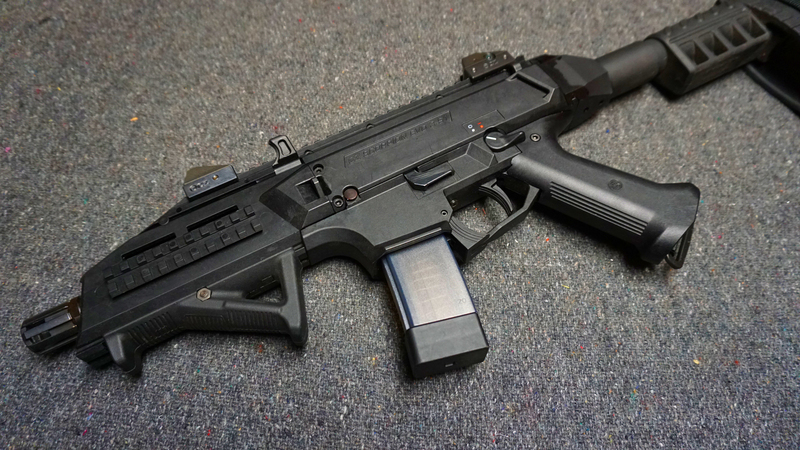 When CZ brought out the Scorpion Evo as a pistol it immediately gained popularity as a less expensive, reliable pistol caliber carbine alternative with affordable magazines. Using an adapter and the right AR-15 style buffer tube and a Sig arm brace makes the gun a handy 9mm package with lots of modern features, ambidextrous controls and frankly it just plain looks cool. Even better, it's extremely easy to work on and the fire control is designed conventionally, making it simple to tune up for anyone so inclined. 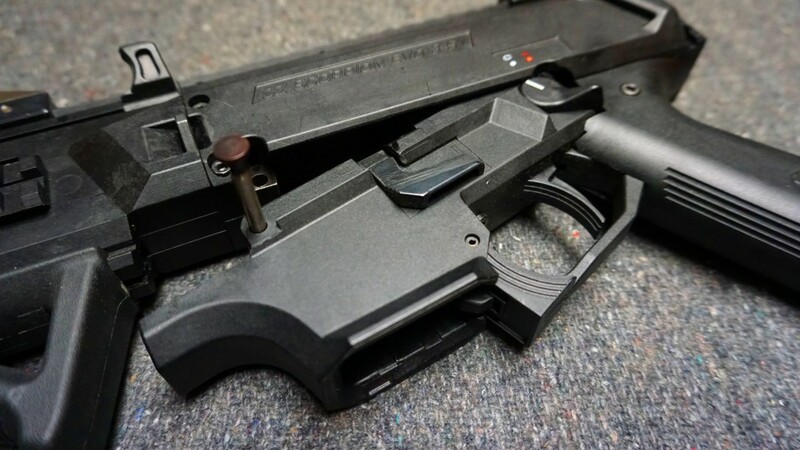 Angled foregrips are A-OK on handguns! 1. Field strip prep. As always, unload and double check that the pistol is clear, set the magazine aside. 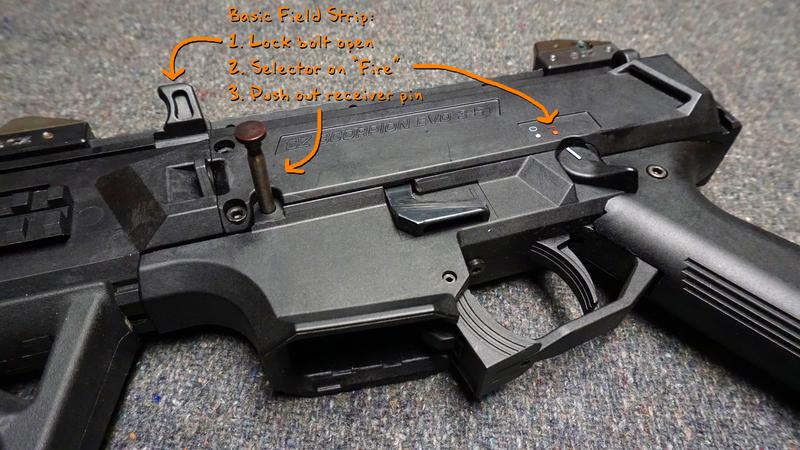 Lock the bolt to the rear, move the selector to FIRE and push out the captive receiver pin. Keep these three requirements in mind. 2. Remove the fire control pack. 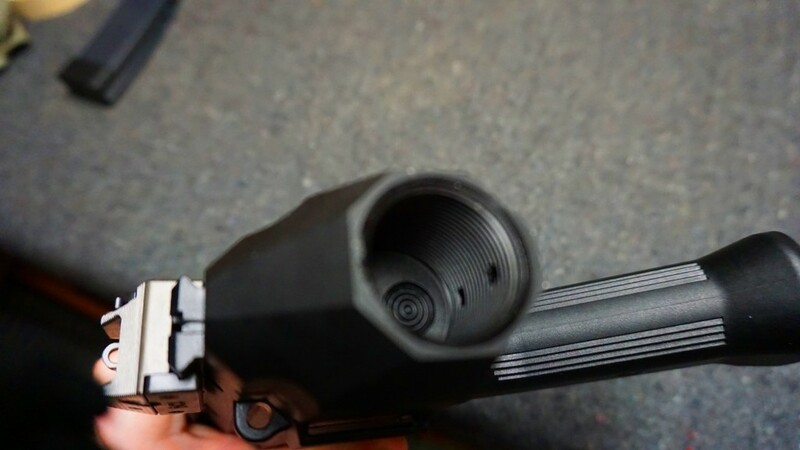 Pull down on the magazine well just below the receiver pin and the fire control pack will pop right out. Modular fire control pack drops right out. 3. Remove the bolt assembly. 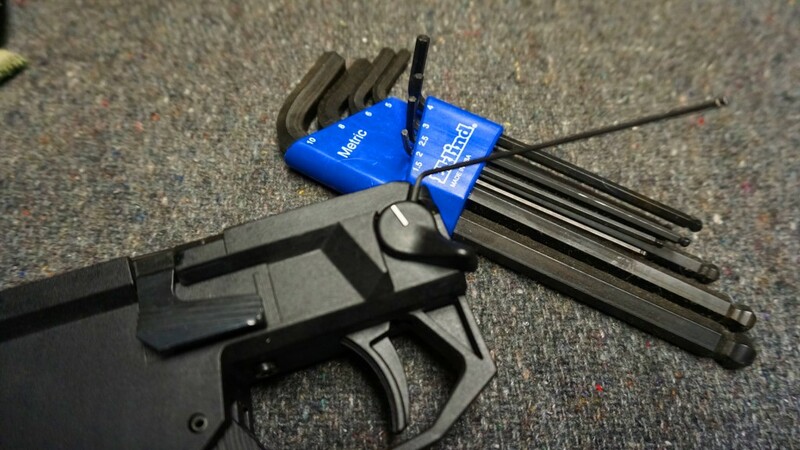 With the gun upside down, ease the bolt forward and pull up on the front of the bolt to slide it out of the receiver. 1. Remove the extractor and spring. Push out the long pin from bottom to top, and be careful as the extractor spring is quite strong. 2. Remove the firing pin group. Push out the pin hidden under the extractor from the smaller hole on the opposite side (toward the extractor side) and this will free up the firing pin. 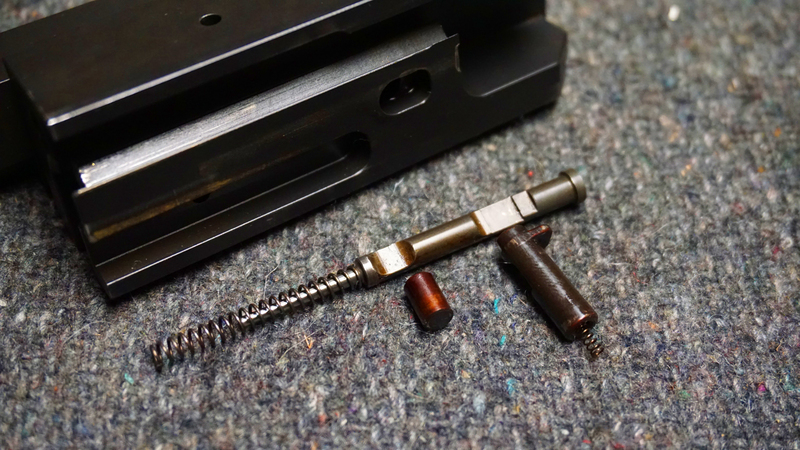 Before the firing pin is removed you'll have to depress the firing pin block plunger, which will lift out once the firing pin is out. 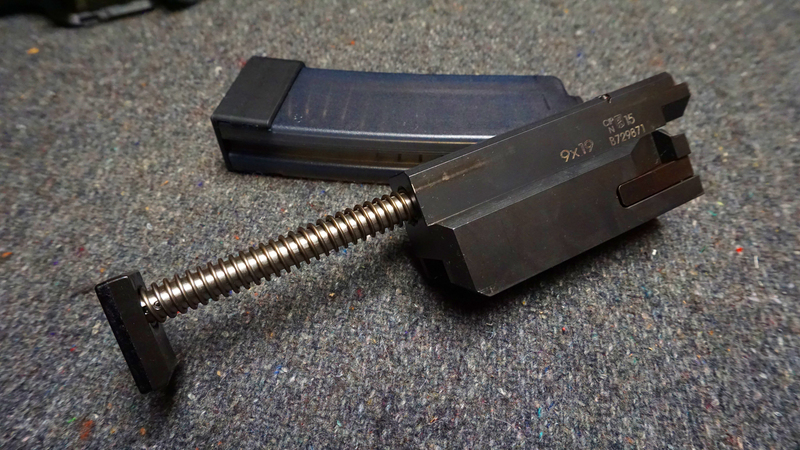 Conventional firing pin system with a cleverly hidden retaining pin. 3. 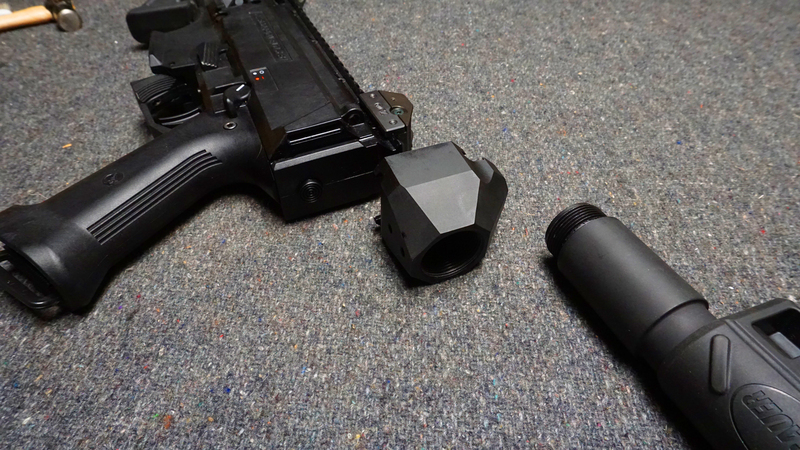 (Optional) Recoil system disassembly. Punch out the roll pin in the guide rod and remove the cap. Not sure if you'd ever need to do this barring a very worn old recoil spring. (Optional) The receiver pin can be removed by pressing down on the bolt release to free it up. It's retained by a cut in the pin engaging the stamped steel bolt stop. 1. Remove the selector caps. This requires a 1.5mm metric hex key, both caps are retained the same way using long setscrews. The caps pull right off and expose the safety drum. 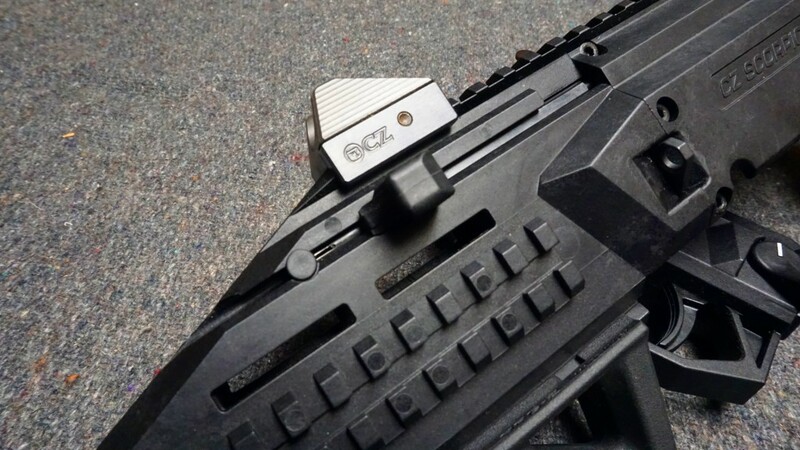 CZ offers blank caps in place of levers to change out easily. 2. Remove the safety drum. There are multiple ways to do it, but rotating the left side of it up and out seems to be the easiest consistent method. Caps, screws, and safety drum. 3. Lift out the fire control sub-assembly. This requires a 3mm metric hex key, and the sub-frame will lift right out the top of the plastic frame. Convenient hole in the trigger guard. 4. Remove the hammer group. Let down the hammer and push out the hammer pin, then remove the hammer and hammer spring. 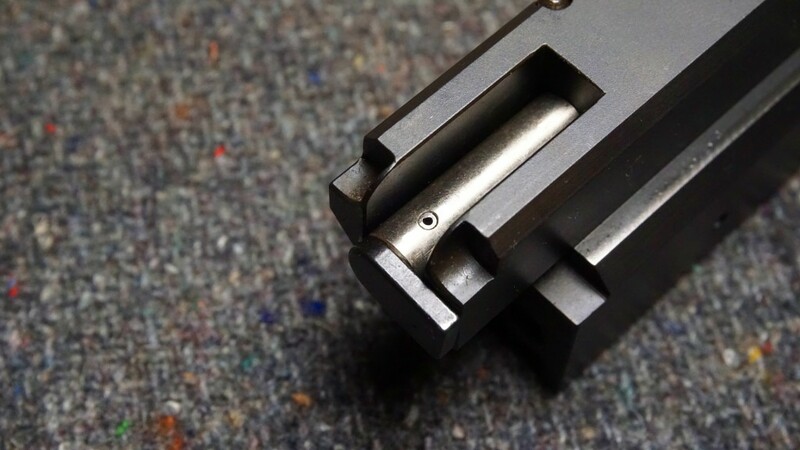 BE CAREFUL WHEN DOING THIS as the lever arm for the firing pin block plunger is heavily spring loaded and is held against the stamped sub-frame wall by the hammer. It can go flying if you let it! Hammer, spring and pin. Beware the lever arm. 5. Remove the trigger and sear. Push out the pin and everything pretty much falls apart from here. 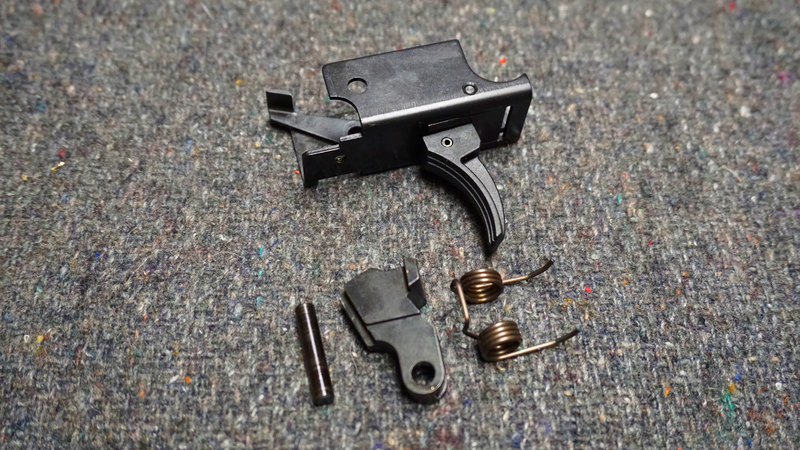 There's no reason to punch out the roll pin connecting the primary sear (steel) and trigger shoe (plastic) so at this point we're done! All of the fire control parts labeled for reference. If you REALLY want to you can drive out the pin retaining the magazine release paddle and fight the spring behind it. I don't recommend it as there's no real reason you should need to. 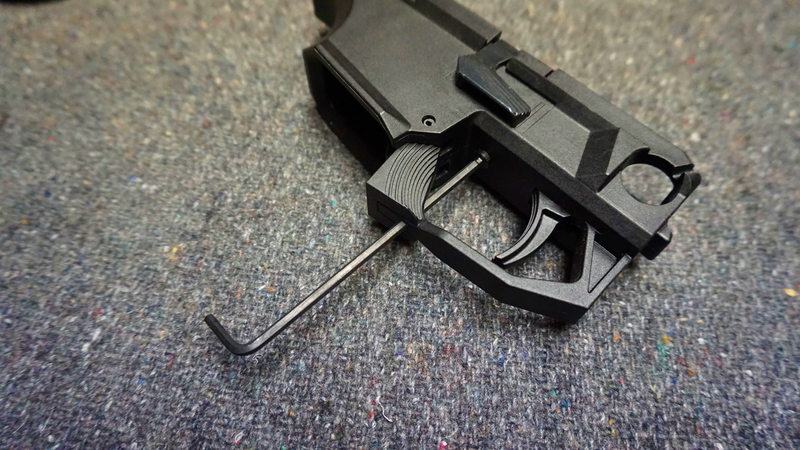 Pop out this pin to swap the charging handle around. Bonus shots of how the adapter attaches to add the buffer tube and arm brace. 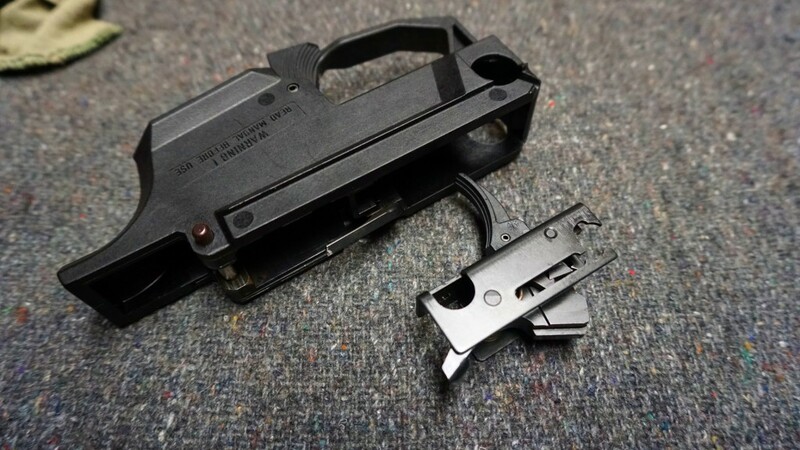 Any further disassembly involves the various screws in the polymer body of the pistol and really isn't necessary or recommended. Have at it if you want, but standard "not my fault if you mess something up" disclaimer applies. 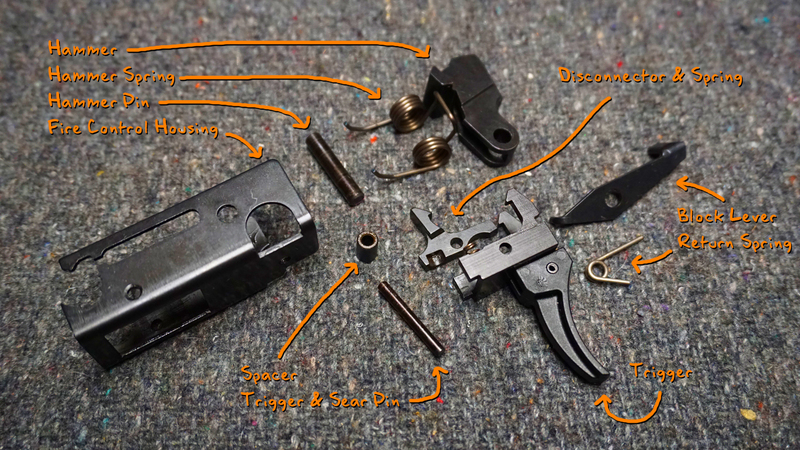 I don't even really have any reassembly tricks, since the gun is so easy to work on. 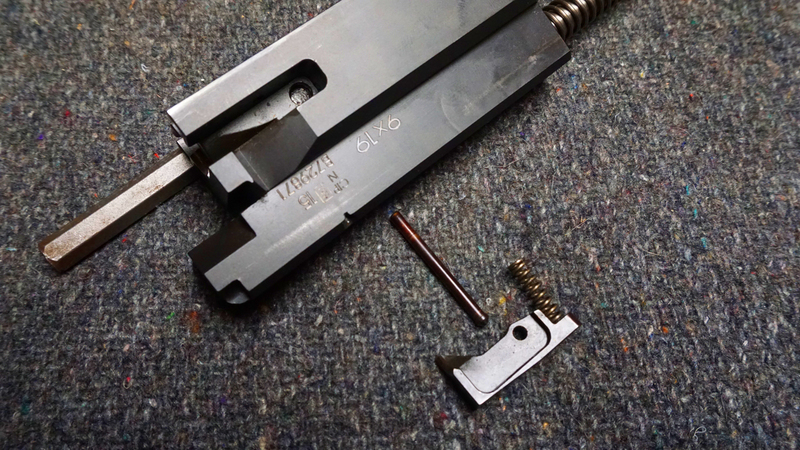 For the return spring, the short leg goes on the bottom and the long leg goes under the firing pin block lever arm right where it connects to the trigger sear. 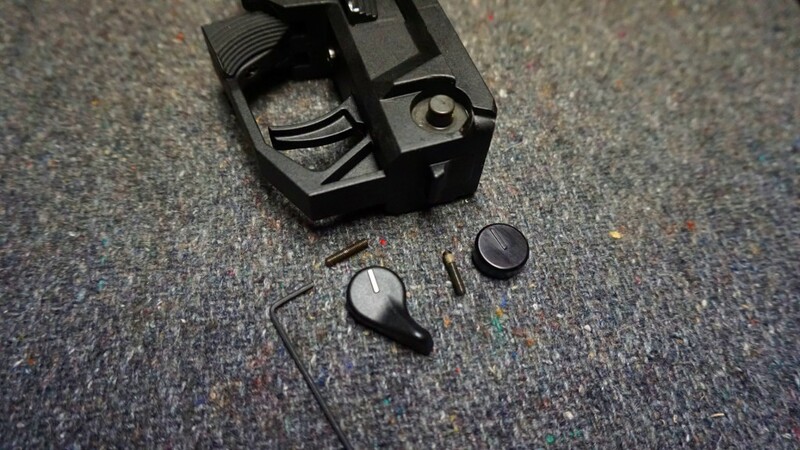 The best way to handle this that I've found is simply assembling the trigger portion first, then pressing the long leg of the spring down using a punch until you can shove the lever into the slot in the trigger sear. Just be sure to keep a finger on it until the hammer is in, or it could fly away on you. 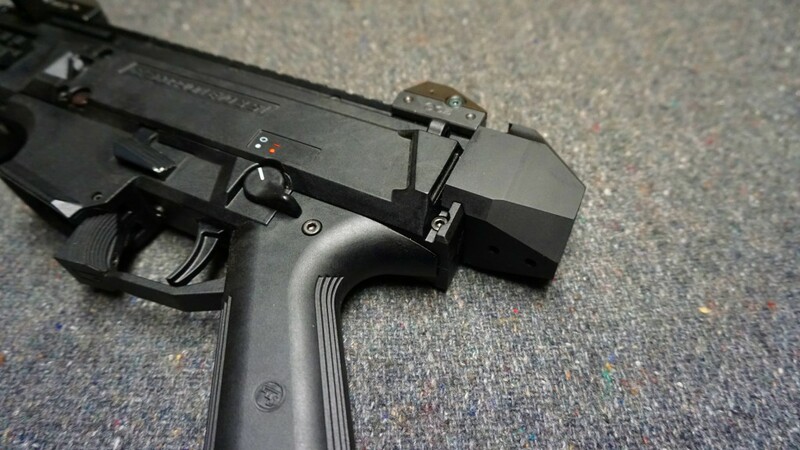 The trigger weight is a common complaint on the Scorpion, but as you can probably see from the photos it's AK-like. The return spring is probably overly strong and contributes a good bit to the pull weight, but if you carefully observe the hammer in motion you'll also notice the engagement angles are VERY positive. Neutralizing that engagement just a bit would likely cut a pound or more off of the weight, with another half to one pound from polish work. It wouldn't be unreasonable to get a nice 5 pound letoff on this gun with some tuning work. Since this gun doesn't belong to me, I won't go chopping on it to find out! Thanks to the owner of this pistol for loaning it to me for review! Guides like this wouldn't be possible without help from friends, family and customers willing to let me rip stuff apart for science.